A major cause of aging is the deterioration of the energy-producing components of the cell, which results in reduced cellular metabolic activity, the accumulation of cellular debris, and eventual death of the cell. L-carnitine helps to maintain cellular energy metabolism by assisting in the transport of fat through the cell membrane and into the mitochondria within the cell, where these fats are oxidized to produce the cellular energy ATP. Acetyl-L-carnitine is the acetylated ester of the amino acid L-carnitine. 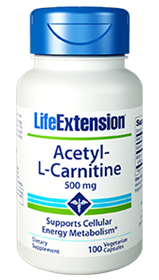 Acetyl-L-carnitine is an endogenous mitochondrial membrane compound that helps to maintain mitochondrial bioenergetics and lowers the increased oxidative stress associated with aging. Acetyl-L-carnitine and L-carnitine are absorbed into the bloodstream efficiently and both are very effective at carrying fatty acids across the membrane into the cell where they are burned as energy and utilized efficiently in the mitochondria of the cell. Acetyl-L-carnitine also guards against oxidative damage.Amyloid-beta peptide is a principal component of senile plaques and is thought to be central to the pathogenesis of degenerating process. Acetyl-L-carnitine exerts protective effects against Abeta neurotoxicity and oxidative stress. About 95% of cellular energy occurs in the mitochondria.Acetyl-L-carnitine (ALC) is the biologically active amino acid involved in the transport of fatty acids into the cell’s mitochondria for the purpose of producing energy. ALC influences the maintenance of key mitochondrial proteins for maximum energy production. ALC easily crosses the blood-brain barrier and may have potential in exerting unique neuroprotective, neuromodulatory, and neurotrophic properties. ALC may improve the age-associated decline of memory, improve mitochondrial structure and function, inhibit the age-associated increase of oxidative damage, elevate the levels of antioxidants, and restore the activity of key enzymes. About 95% of cellular energy occurs in the mitochondria.Acetyl-L-carnitine is the biologically active amino acid involved in the transport of fatty acids into the cell’s mitochondria for the purpose of producing energy.Acetyl-L-carnitine easily crosses the blood-brain barrier and may have potential in preserving neurological function. Take two capsules once or twice daily, or as recommended by a healthcare practitioner.